On display at the festival will be hundreds of hand-crafted quilts in all sizes, shapes, colors, textures, and designs. Awards and prize money of $20,000 will be given in 58 categories. The show features some amazing craftsmanship on display. Aside from the beautiful display quilts, the core of the festival is a long list of quilting classes taught by professional quilters. Whether you’re brand-new to the practice or have been quilting for years and are looking for nuanced expert tips, you’ll be sure to find a few classes that call your name! Check out class options here. Do you own an antique quilt that you’d like to have appraised? Discover its history and worth at the festival. A professional appraiser will be onsite to take a look at your piece – by appointment and fee. Throughout the week, bed turnings will be held where you can come and listen to local guild members and quilters explain the history and techniques behind antique quilts made prior to 1968. Hear the unique stories of the quilts themselves and the people who made them, including historical information about the practice of quilting. There’s much more to see and do at the festival as well. Check out the official website to learn more. Quilting has been a widely practiced craft in nearly every part of the world for thousands of years. In one form or another, Egyptians quilted, early civilizations in the Middle East quilted, and knights of the Middle Ages even wore quilted garments beneath their armor. The word quilt comes from the Latin word “culcita”, meaning a stuffed sack. America has a unique and special relationship with quilting. Early Dutch and English settlers arriving in the New World in the 15th and 16th centuries were settling a untamed land with a diverse climate. Making their own goods — including bedding, clothes, and other linens — was essential to their survival. By piecing together various materials and fabrics and making use of scraps and remnants, early Colonial women quilters were keeping warm the people who would build this country. Over time, American quilting became a principal folk art of the nation and one that we’re known for world-wide. 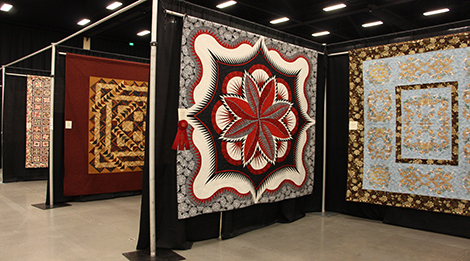 In Pigeon Forge, the very first A Mountain Quiltfest was held on March 24th in 1995, as an expansion of the quilt show that two local quilt guilds had been putting on in a local church basement. After requesting permission from the guilds (The Piecemakers and the Sevier Valley Guild), Pigeon Forge’s Director of Special Events Bob Easton enlarged the show and brought it to the Pigeon Forge Holiday Inn for its first year. At the time, the festival consisted of just around 150 quilts, a few classes, and several local vendors. Today, however, it is one of the most popular and anticipated festivals in the area and attracts up to 20,000 visitors a year. For more event information check out the Mountain Quiltfest website or call the Pigeon Forge Department of Tourism at (865) 453-8574.